Come and meet some of the happy inhabitants of the Isle of Wight Donkey Sanctuary when they visit us at the Garden this half-term. On Friday 16th our friends from the Donkey Sanctuary will be here on the lower lawn so come and say hello, give them a pat and hear all about their rescue stories. 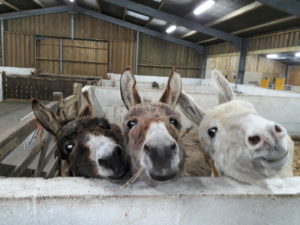 THE LOVELY DONKEYS ARRIVED, DON’T MISS THEM! !